602 lithic artefacts were recovered from the Carnoustie excavation and subjected to analysis by Torben Ballin. He found out that the lithics mainly comprise flint and quartz but with some pitchstone and quartzite. About 92% of this assemblage is waste material produced in the making of prehistoric stone implements. The remaining 8% of the lithic artefacts are actual tools such as arrowheads, knives and scrapers. The flint included local material collected along the nearby shores of the North Sea (this kind is quite common in assemblages from eastern Scotland) as well as Yorkshire flint. The local flint/Yorkshire flint ratio is 68:32. In this region of Scotland, the local reddish flint was used throughout prehistory, whereas the Yorkshire flint was used mainly during the Middle and Late Neolithic periods. This is borne out by the two timber halls at Carnoustie (that are likely to be Early Neolithic) which are entirely devoid of Yorkshire flint, whereas this type of flint is common in the pit groups elsewhere on the site that contained later Neolithic objects. Five pieces of pitchstone were also recovered. This form of volcanic glass (a close ‘cousin’ of obsidian) was procured from the Isle of Arran in the Firth of Clyde. The distribution of diagnostic pitchstone objects and associated materials like Cumbrian tuff and pottery of the Carinated Bowl Tradition suggests that in southern, central, and eastern Scotland most pitchstone probably dates to the Early Neolithic period. 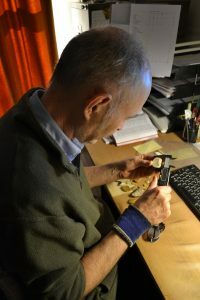 One of Torben’s conclusions is that though the archaeological features we excavated indicate that the location was occupied during the Early Neolithic (the timber halls), the later Neolithic (the pit groups), and the Bronze Age (the roundhouses and the hoard), the diagnostic lithics only derive from the two earlier periods. The timber halls are associated with Early Neolithic lithics (leaf-shaped points, pitchstone), whereas the pit groups seem to be associated with exclusively later Neolithic lithics (oblique arrow-heads, Yorkshire flint, Levallois-like technique). There appear to be no diagnostic lithic artefacts from the Bronze Age. This entry was posted in Blog on May 29, 2018 by Author.